As always, if you have any problems with or questions about the pattern, just message or email me, I'll get back to you as soon as I can . Gauge isnt important, as long as your choice of yarn and needle result in a tight stitch so that stuffing material won't show through. Numbers in ( ) at the end of each round/row indicate the total number of stitches that should be in each round or row. Begin stuffing at this point if you haven't already, continue to stuff and shape as you go. Stuff and shape the body very firmly. F/O, add any stuffing to finish the shape out firmly. Weave in end through last round and pull to close. Secure and weave in ends. F/O. Do not stuff, flatten and weave in end. F/O stuff very lightly just to give it a little shape. Weave in end. Row 2-6: same as first point. After final point, glue on jewels or cut pieces of colored felt and glue/sew on as shown to each point. I recommend pinning all pieces in place before sewing. In this particular case, I finished the face before I pinned and sewed the wings/tail/crown so that I could be sure of proper placement. Embroider the eyebrows as shown. Add pieces of black felt for eyes. Cut a piece of red felt for the mouth and some white for the teeth. (you might find cutting them from paper first is best, so you can be sure of the size and shape before cutting your felt) Cut a long piece that is rounded on one end for the tongue. Run a length of sewing thread through the flat end and gently pull to gather, sew to mouth as shown so that it drapes over. Add wings, tail and crown as shown. Boo, King Boo and Mario Brothers are all copyright Nintendo. In general, I use a good clear drying fabric glue for adding felt pieces to crochet. It just tends to be more consistent and will nearly always hold even through a machine washing. If you use something like Elmer's Glue, it will dissolve in wash water, and your pieces will come off. I really want to make this for a friend of mine. Do you join the rows at the end or just crochet a continuous round? Thanks for posting this awesome pattern! he's about 9 inches tall (including the crown). It could be that you're using a thicker yarn type, a larger hook, that your tension is looser or a combination of any of the above. I really can't say why it's flat... perhaps if you could take a picture and send it to me in email? WolfDreamer@live.com then maybe I could help you figure out what's goin on? I just love your patterns. They are easy to follow and the final product looks like it should. My 4 yr old grandson absolutely loves the Mario Plushie that I made for him. Thank you for sharing all the wonderful patterns. Have you thought of adding some of the Super Mario characters to your list ? Wow-great patterns! I'm new to this and Boo is my 1st one I'm trying. I've got the parts done except the crown and I'm trying to embroider the eyebrows....but having an extrememly difficult time. I've never done this before so do you have any tips-starting points, etc? The body and parts were clear but I'm stuck on the embroidery part. Embroidery is mostly just practice. Don't try to insert the needle all the way through the stitches tho, just stay 'on the surface' of the crochet. Tug only enough to set the stitch, don't tug too hard or it will tend to 'pucker'. 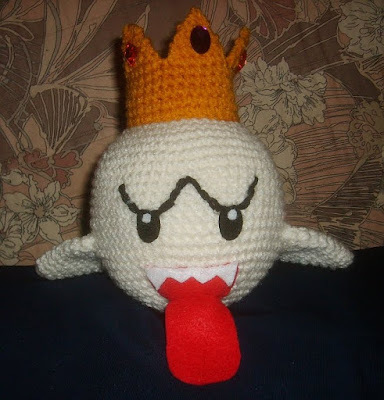 I am also having trouble with a flatter King Boo. How firmly is the body stuffed? I don't want to overstuff, but I just finished round 25 of the body, and the sides are only two or so inches tall... Do I stuff the body so tightly it forms as sphere, or did I do something wrong? I'm also experiencing some difficulties with a rather flat Boo. I don't join the rounds and the increases end up right on top of each other, forming a wavy octagon. I'm gonna start over and shift the increases slightly, so I don't get them aligned, and I'll get a rounder shape. Perhaps this solves the flatness. I seem to be having trouble with the rows of the body. You say that the third round should have 24 stitches from the beginning, but i am way over that amount by the time i reach the end of my row. Is it better to complete the round or to keep to the stitches number? I'm not even sure why I'm off by so much. That means: sc in the next sc, 2 sc in the next sc, sc in the next sc, 2 sc in the next sc, etc. -- all the way around to the beginning of your round. Yup thats my problem. I misinterpreted the instructions and thought i had to only repeat the second part of each line. If you think of the shape, the first third of your pattern is the 'expanding' portion ... the second third is the 'equator' portion, and the final third is the top of the round. yeah, my boo is as flat as a pumpkin. i think i made my stitches too tight. oh well, i will try again another time. thanks for your help! Awesome pattern! I'm about halfway finished the body of Boo, and didn't realized how big he'd get! I'm still determined to finished though. Just a suggestion, maybe include some sort of object in the photos of future crochet projects as a size reference (like a penny). Thank you for all the wonderful patterns! Sorry, what is a magic ring? Aww man mine turned out flat. which I thought was strange, so I was going to add a few more rounds to the middle part. (the 80 sc rounds) but I decided not to and thought that my stuffing would make it rounder but it didnt help much. So idk what I did wrong. and even my wings are different from yours.. So strange. Thanks for the pattern though, it's super cute! Thanks very much! Awesome pattern! I blogged him this week. He looks a bit more bedraggled than in the pix now as he's been carried round as the constant companion of my 4 year old! At round 10, is it supposed to be a wavyish flat circle? I'm trying the pattern for the third time, having gotten to about row 12 each of the previous times. This is the fourth pattern I've done of yours (I've done three mushrooms, Chain-chomp, & Bombomb) and those patterns were perfect! With this one,I started with joining rounds, and that didn't seem to be working, so I ripped it out and did continuous rounds, but that didn't work either. I keep ending up with a flat disk with a tiny lip, and it doesn't look like it's going to give me a ball shape at the end. I started wondering if I should try to get the body part of the pattern by borrowing from one of your other patterns. Do you have a ball-shape approximately the same size on another pattern? Also, want to thank you for posting all of these. My kids have REALLY been enjoying them, and your directions are very well written! It doesn't work! 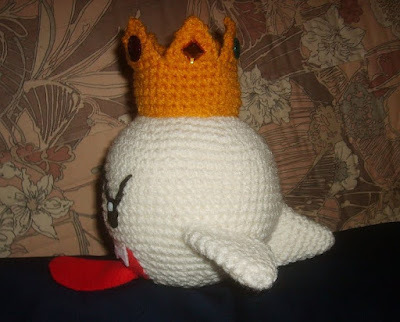 I did it and my king boo is look a like an Mushroom. Are you sure that is the right pattern? I'm so frustrated! I agree with Mei. I started making this as a birthday present for a friend's daughter and much to my dismay it has come out nothing like what is depicted in the images displayed at the beginning of this page. I've ended up with the top of a mushroom each of the 3 times I've gone all the way though the pattern. Needless to say I find these patterns to be questionable at best. Many people see the crochet part alone and don't feel it is right. The crochet itself doesn't provide the shaping - the stuffing does. If you maje it 'perfectly' round in the crochet shaping, then when it is properly stuffed it will be misshapen. That is part of the nature of the craft. How do we post pictures of our completed projects??? I made king boo, eevee, and am working on Lugia. Thank you for helping me make my kids Christmas. If it wasn't for your free patterns, they would not be opening any gifts this holiday season. Again, thanks for sharing your awesome talent with me!!! !